The line had begun forming at 3 p.m., though the time varied according to whom you asked. A young American Marine, Claude Martin, at the back of the line — the very back, since after less than an hour, the hired security forbade any more people from lining up — said he had heard whispers that the earliest comers had arrived at 3 a.m. It was a damp Tuesday evening in London, but they waited down the block and around the corner to get in, mostly young men, mostly in sneakers, at least one with a Supreme bag. It wasn’t a so-called product drop. It was an opening at the Gagosian Gallery. “We have never had a lineup around the block to get into an exhibition,” said Nick Simunovic, the director at Gagosian Hong Kong. The occasion was the opening of “Future History,” a collaborative exhibition by Virgil Abloh, the American designer behind Off-White, and Takashi Murakami, the Japanese fine artist whose menagerie of adorable cartoon monsters have become pop totems (and the guest stars on a best-selling line of Louis Vuitton accessories). Each man is a hero of the “hypebeast” community, and they came together last year at ComplexCon, the annual convention at which hypebeasts swarm. 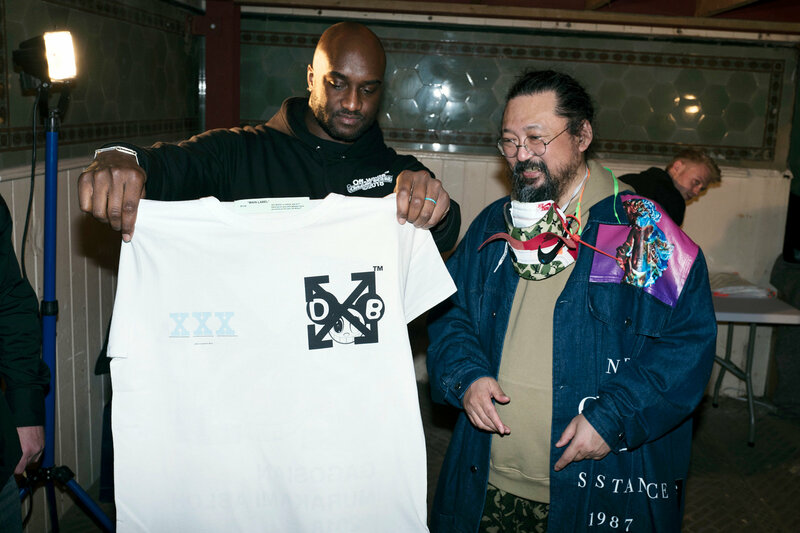 Mr. Abloh and Mr. Murakami had set up a silk-screen station to create T-shirts together and were mobbed. 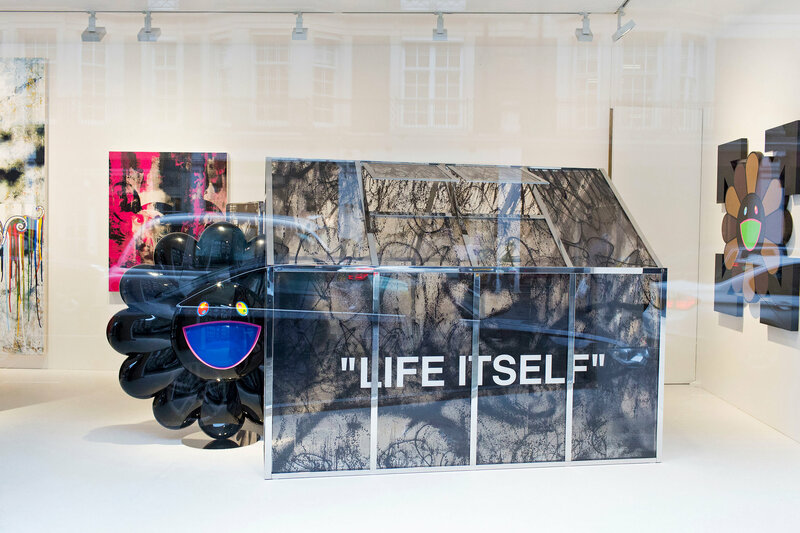 ComplexCon had led here to Gagosian, the gallery that represents Mr. Murakami, for which, over the course of about two and a half months, he and Mr. Abloh collaborated on paintings and sculptures. Mr. Murakami made a large sculpture of one of his smiling flower characters; Mr. Abloh built a greenhouse around it. Mr. Abloh requested a screen print of an image from a 17th-century self-portrait by Gian Lorenzo Bernini; Mr. Murakami screened the mouselike ears of his character Mr. DOB on top. “Truth be told, I don’t go into these things knowing if they’ll work,” Mr. Abloh said. The day before, Mr. Abloh, in T-shirt and camouflage pants, and Mr. Murakami, in baggy sweats and Off-White Nikes, had installed the show and discussed their working process. “My position is, he’s the master, I’m the labor,” Mr. Murakami said. They had come together each with their own thoughts and bounced them off each other, and developed ideas quickly. “From the idea to do the show to what some of these first pieces would be was, maybe, two minutes,” Mr. Abloh said. Both men’s icons are instantly recognizable in each piece — Mr. Abloh’s ever-present air quotes, Mr. Murakami’s characters — but here they’re presented as co-signed artworks, even if Mr. Abloh’s usual media are clothes and shoes. It could well end up in one. 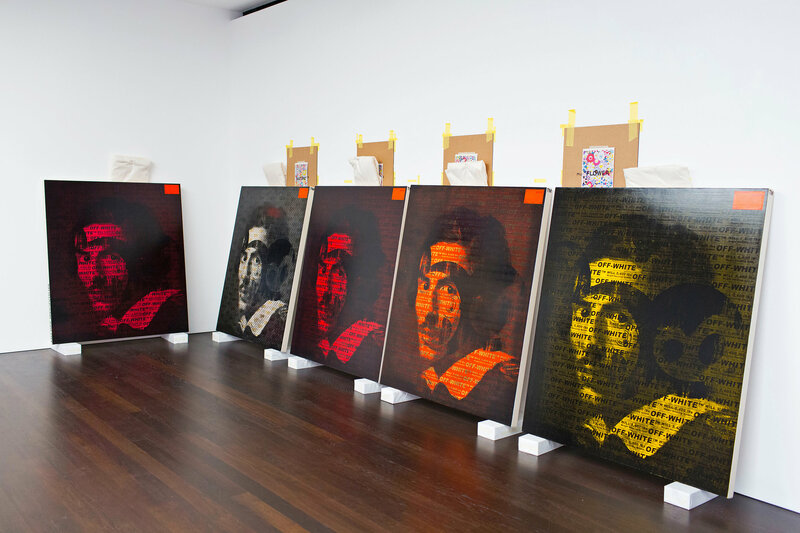 Even before the exhibition’s opening, half of the pieces had been sold. “The feedback and results have been incredible,” said Mr. Simunovic, the gallery’s liaison to Mr. Murakami. “We sold a painting today, for example, to a 21-year-old who had never worked with the gallery before.” The gallery does not disclose artwork pricing. Outside, they were still waiting. Even Mr. Martin, the marine. “I’m not going to get in,” he said, with admirable even temper. There was over an hour to go. Luckily, the exhibition remains up through April 7.